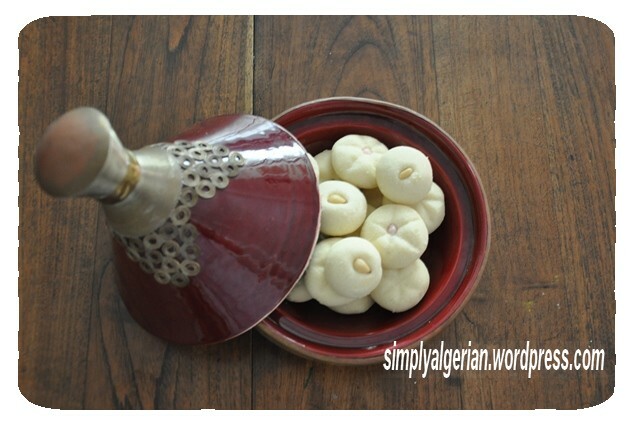 Ghraiba, ghribiya, ghoriba, ghorayba, koraybades, montecaos…………is a short bread cookie , found in almost all Medditerranean countries. the flavors for this ghraiba are endless and very versatile……..nuts, spices, cocoa, sesame seeds and plenty of other interesting ingredients could easily be added to give extra character to the basic recipe. 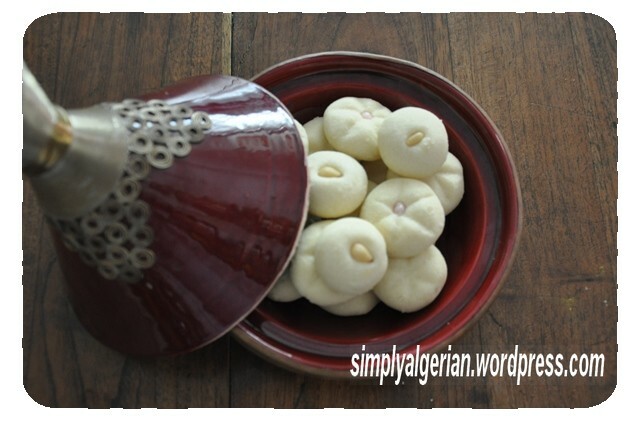 this cookie can be prepared for special occasions like Eid or as an every day treat. 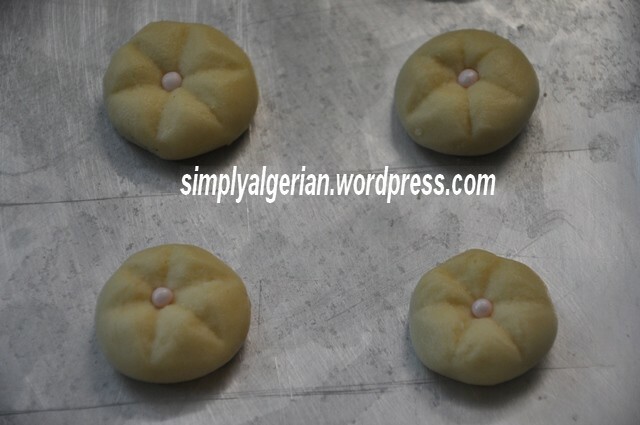 in Algeria, ghraiba is considered among the basic pillar of the traditional pastry alongside makroud and baklawa. the Ghraiba I ‘m going to share with you today is the North east part of Algeria version,a recipe I inherited from my late grandmother. 1-using clarified butter ( smen, samne’, indian ghee ) is not optional , try not to substitute it with butter. smen gives you the authentic ghraiba flavor and this typical ivory color, which you won’t get when using butter. 3- oven must medium -low preheated ( 160/170°C maximum) . in the past, when our grandmothers still baked their pastry at their neighborhood bakery, they used to ask the baker to leave the trays of ghraiba to the very end . after finishing with the multiple rows of makroud and baklawas trays , he would switch off his oven then bake it for 10 mn or so. 2- add in the sifted icing sugar and continue to bit for another 5 minutes or so, add the vanilla extract or powder if desired. 3- gradually add in the sifted flour , adding a handful size each time . when it becomes hard to continue using the electric beaters. stop, and use your hands instead, adding each time more flour if required . for the measure above, my dough needs almost 3 cups of flour, but I always stop somewhere between 2 and 1/2 cups and keep the dough refrigerated for 1/2 hour before shaping and baking my cookies. this technique helps me get a very soft and melt-in-the mouth ghraiba. 5- bake in a medium low heat for 10 to 15 minutes. leave it to cool on wire rack before keeping it in an air tight container. 3-la ghraiba n’aime pas le four chaud. jadis quand nos grand meres envoyaient leur gateaux au boulanger du quartier, elles lui demandaient de laisser la ghraiba en dernier et commencer par les plateaux de makroud et de baklawa. quand le boulanger terminait la cuisson de tous ces gateaux. il eteignait le four et mettait la ghraiba a cuire ds le four encore chaud grace au braises fumantes. 4- assez de farine pour ramasser la pate. ajouter le sucre. continuer a battre pour 5 autres minutes. ajouter la vanille si vous le desirez. Ajouter la farine graduellement tout en continuant a battre. quand ca devient difficile d’utiliser le bateur. arretez et continuer a travailler a la main. retirer la pate de ghraiba du refregerateur. rouler la en petite boules en en losanges, decorer au choix . et faite cuire ds un four moderemment chaud (( 160/170°C maximum) pendant 10 a 15 mn voire un peu plus , dependemment de votre four. la ghraiba doit rester pale et fragile au toucher. laisser completement refroidir avant de la transferer dans une boite hermetique. servir avec une tasse de cafe’ turc ou du the’ a la menthe.